Who doesn’t love a treat? While fruit and yogurt are great to finish everyday meals, sometimes a special pudding is just what’s needed. Although, for our first dessert, we’re not going to stray too far from the fruit and yogurt basis!For a healthy summer dessert that can be enjoyed equally by adults and kids, it’s hard to beat a fool. 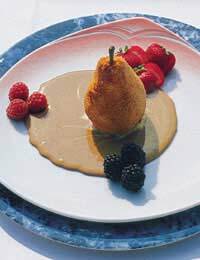 At its most basic and traditional, a fool is a mixture of pureed fruit (fresh or cooked) and cream, with a little sweetener. In our recipe we’ve suggested using yogurt for a healthier approach, but you can use whipped double cream or a mixture of cream and yogurt. And you can vary the fruit. Try apple, rhubarb, gooseberry, redcurrant, mango – but remember some will need pre-cooking. Place about ¾ of the raspberries in a bowl and sprinkle with the sugar. Leave for 5 minutes to allow the juices to come out a little. Then blend the raspberries and sugar in a liquidiser. Stir the puree into the yogurt. For young children, serve as it is; for older kids and adults, top with the remaining berries, a sprig of mint and serve with some crisp shortbread fingers. For a dessert with an autumnal feel, there’s nothing easier than seasonal baked apples or pears. Remove the core from the apple. Cut around the apple with a sharp knife – just deep enough to break the skin. Place the apple in a baking dish with enough water to cover the bottom of the dish. Mix the raisins, oats and honey together and use to fill the space where the apple core used to be. Bake for about 40 minutes until soft and tender. Preheat the oven to 200oC, gas mark 6. Butter a shallow baking dish. De-stalk and peel 4 pears. Cut into halves and remove the cores. Lay the pear halves cut-side-down in the baking dish. Scatter the sugar over the pears and dot the butter around. Cover and bake for about 20 minutes or until the pears are tender. Now here’s another familiar favourite! Preheat the oven to 150oC, gas mark 2. Put the rice in a sieve and wash under hot running water. Drain and place in a heatproof dish. Add the sugar and the milk. Add a knob of butter and a sprinkling of nutmeg. Bake for about 2 hours until the rice is creamy. There must be as many recipes for crumble as there are people who make it. This one gives you a fairly solid or crunchy crumble. Try using a mixture of wholemeal flour and porridge oats. Or stir in some desiccated coconut or sultanas. Prepare the fruit. Peel, quarter and core the apples. Cut into thin slices and put half into a pudding dish. Sprinkle with sugar. Add the rest of the apples. Rub the fat into the flour. Add the sugar and continue rubbing in. You should end up with a lumpy mixture! Spoon it over the fruit and spread it out evenly. Cook for about 45 minutes until golden and crisp. An alternative to crumble, and one’s that particularly suitable for spring when the young rhubarb is shooting, is fruit sponge. Preheat the oven to 190oC, gas mark 5. Grease a baking dish. Wash and trim the rhubarb. If it’s older, you’ll need to strip off the dark red outer layer. Cut into chunks about 1” long and put in the baking dish sprinkled with the sugar, orange zest and water. Cream the margarine and sugar until light and fluffy. Add the beaten egg and mix well. Using a metal spoon, fold in the flour sieved with the salt. Alternatively use the all-in-one method with a food processor but add ½ teaspoon baking powder to the flour. Spread the sponge mixture over the prepared fruit and level it off. Bake for about 35-40 minutes until the sponge is well-risen and golden.